Zoe Labouré took the name Catherine when she joined the Daughters of Charity in Paris, France. As a young novice in 1830, Catherine was awakened in the middle of the night and led into the chapel. Mary, Our Lady of Grace, took a seat in the director's chair on the altar. Catherine knelt at her feet and rested her hands on Mary's lap. Mary told her God was giving her a mission. Next, she appeared with arms outstretched, rays streaming from her hands symbolizing graces given to her by God to bestow on those who ask for them. She was surrounded by the words “O Mary, conceived without sin, pray for us who have recourse to thee.” Mary said, “Have a medal struck in this form, all who wear it will receive great graces.” Catherine told no one but her confessor, who eventually had the medals made. Soon the graces Mary spoke of swept the world and people began calling it the Miraculous Medal. Today, if you are catholic, you probably have one. Wearing it is not a superstition, but an act of faith in Mary's intercession before the throne of God. As for Catherine, she kept her secret all of her life, going about her duties in a hospice for old men. She tirelessly tended to their needs with love and compassion. Upon her death at age 70, all were astounded when it was announced that Catherine was the sister of the medal. 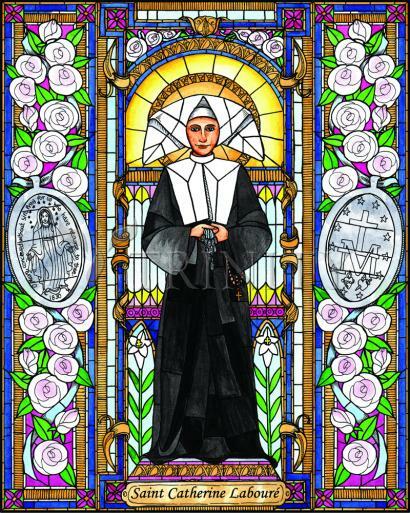 Her feast day is November 28. While I contemplated her, the Blessed Virgin lowered her eyes and looked upon me. Then I heard a voice saying to me: “The ball that you see represents the entire world... and each person in particular. These rays symbolize the graces that I shed on those who ask for them.” With this I understood how agreeable to the Blessed Virgin are the prayers addressed to her. I discovered how generous she is toward those who invoke her, what precious graces she would give those who would ask them of her and with what joy she would grant them. I knew nothing. I was nothing. For this reason God picked me out.